They discuss a temple in India that was carved out of a rock. Pretty darn impressive to say the least. The whole episode is quite interesting (as is the series in general, for the most part). A lot of stuff has been covered in this series that I've gone on to research for myself and found out most of it seems quite true. This was the first episode that actually bugged me because I was like "uh... stupa is a means for travelling into space? Never heard that before. 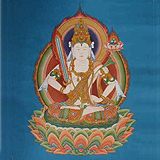 The various beings painted on the thangkas etc. are genetic experiments of aliens? Sure, okay..."
Now, if I wasn't already familiar with Buddhism, I'd probably think that in the context of the full episode and the previous episodes that this made sense because when they point right after the Buddhist temple bit, there is a church in Ethiopia that was carved out of solid rock from the top down supposedly with the help of angels, I'm like, "yeah, that sounds like aliens to me!" And when they talk about other monsters, I think "yeah, that could be genetic experiments," but, as soon as they get to Garuda, I'm like, "uh, no." The episode about monsters/genetic experiments is Season 3, Episode 2, by the way, which is also on YouTube. The first 2 seasons were great, imo. I'm just starting the 3rd season and this material seems weaker, but these churches and temples are certainly amazing and suspicious feats for ancient man. Angkor Wat is something else, too. Wow what has happened to the "history" channel lately? Yes this is a well known and frequented tourist site. My folks went last time they were in India. But I don't know why they put it into this crappy show. padma norbu wrote: A lot of stuff has been covered in this series that I've gone on to research for myself and found out most of it seems quite true. This show lost all credibility for when they discussed how Christian art from the Renaissance depicted alien visitation. It's not that I discount the viability of aliens, but defrauding beautiful pieces of Christian art in the name of conspiracy is ridiculous. Nah, what's ridiculous is not being able to see that Christian art obviously shows UFOs. Last edited by padma norbu on Wed Oct 05, 2011 9:13 pm, edited 1 time in total. Karma Dondrup Tashi wrote: Wow what has happened to the "history" channel lately? Maybe they got tired of being known as the Hitler and Jesus channel? If you actually spent some time watching the series, you would definitely learn a few things. For one thing, the "history" you've been taught is quite often a total farce, so this is really nothing to snicker at. I am quite certain there has been extra-terrestrial contact for thousands of years. Are you aware that several dozen countries have gone on record as stating that the UFO phenomena is real, they've released their files to the public and have requested the USA to do the same? Or that a British hacker got into the Pentagon and NASA computers and found info and pictures of UFOs, a full "star fleet" as well as alternative (free) energy technology? Sound funny? How about when you realize that America is going to great lengths to have this man extradited so that they can imprison him for the rest of his life all while not acknowledging any of his claims? There is a fun press conference in Britain where one reporter asks Obama about this case. After stammering through an answer, he says "thank you" and leaves abruptly. The only reason I haven't bought this book is because I took a look and I am quite positive every aspect of it is covered in the Ancient Astronaut series. alwayson wrote: Yes this is a well known and frequented tourist site. Well, for one thing, how the hell did they carve all that out of a mountain? This series, as do all "UFO", proof relies on the human mind's misinterpretation of repitition of a topic as "proof" of the validity of that topic. The first time you are introduced to the topic that they want you believe it is a question such as, "Is it possible that this drawing shows a ancient crude drawing of an alien wearing a space suit"? Then before you have time to consider the answer, they are off to another topic and image...diverting your mind from serious consideration of their question. A short time later they show some similar images, and they ask, "Could these drawings also be ancient aliens wearing space suits"? Again, before you have time to consider the question, your attention is diverted by another visual object. But your mind recalls the mention of that topic previously...didn't you hear something like that before? They do this and mention that topic they want you to believe and divert your attention from serious consideration perhaps half a dozen times. When they think you are ready the set the hook. They show you a unclear image of an ancient "alien" wearing something that "might be" a space suit. This time what they say is, "As we have shown before there are many depictions of ancient aliens wearig space siuts and like this one". Because your mind has a hazy memory of being shown other similar images...you bite deep on the hook...and they reel you in. They may go so far as to assert, "As we have PROVED before there are many images of ancient aliens wearing space suits". But they didn't really prove anything did they? They merely made suggestions, it was your mind connecting those suggestions, and making from those suggestions a "fact" it created from it's own illusions. It's a standard propaganda trick used for such things as political campaigns, advertising, and other forms of misrepersentation of information. In short, it is brainwashing. The politest way to describe this process is "Male Cow Excretement"....but it has a less polite name that starts with the letter B. Don't be fooled by it. I find it odd that people who adamantly believe in spiritual beings they've never met always get on their goofy helmet when you talk about UFOs. The things you bring up are diversions in themselves; people always try to sound "rational" just as you have by explaining the "trick" about how "they fool you" with these supposedly duplicitous tactics. Your characterization alone is a persuasion technique just as duplicitous. You pointing out that one might say, "doesn't that look like a person in a space suit" and then 'diverting you' (your choice of words) with another object that suggests something similar is akin to me pointing out that you have just diverted from the evidence that it does indeed look like a person in a space suit and that other 'diversion' (so-called) is indeed equally suspicious if not more so. You tell me to not be fooled by it, but you are the one who has been fooled. There are mountains of evidence in favor of UFOs and extra-terrestrials and extra-terrestrial contact. All these incredible megalithic structures which we really have no idea how they could have been made (just for drinks, mind you; this is before we even get the bread, and way before "starters") and you shrug your shoulders and assume the experts would have told you if they thought alien technology was necessary to build such structures. What you have said above is the most basic, non-interesting status quo type thinking you could have possibly offered on the subject which shows a very closed-minded attitude as well as only a cursory knowledge of the evidence, but you are the one who's supposed to be educating me. Every episode is 60 minutes and the first few specials were 2 hours (45 minutes and 1.5 hours, I suppose, with commercials). That means I have watched roughly 25 hours of the program... you? How much reading have you done on the subject? Be honest with yourself here. What have you read? What books have you taken out of the library or bought? About zilch? In addition, I have watched countless hours of documentaries online, read several books and am well aware of various problems in early "researchers" like Von Daniken and Sitchin. Every single talking head who comes on the screen I am highy skeptical of: Von Daniken, obviously, the guy with the funny hair whose name I can't pronounce, David Wilcock who claims a lot of kooky stuff on his website including the fact that he's a reincarnation of Edgar Cayce. However, up until Season 3, I didn't find much to complain about. In fact, with this my previous understanding of UFO exploitation and junk science, I began watching the series just out of basic curiosity, but mostly for a laugh (because I was familiar with History Channel's b.s. Nostradamus and 2012 and DeVinci Code nonsense and was expecting roughly the same). You can't fill 30 hours worth (3 seasons) of programming without repeating yourself and not have a decent amount of evidence. There would be no show. And what you characterize as diversion brain-washing tricks are simply a way to squeeze as much information as possible about a theme into each episode. So, while they are talking about ancient artifacts resembling people in space suits and flying machines, you would expect to find several examples of this from across the globe. When they take two of those air plane models and show that they actually do fly beautifully, it becomes really apparent that status quo interpretation of these ancient cultures is at least slightly off the mark (that plane was supposed to be a stylized fish and that other one just a bad sculpture of a bird), but "Who ya gonna believe, me or your lying eyes?" ... right? Last edited by padma norbu on Thu Oct 06, 2011 4:05 pm, edited 1 time in total. I love the whole UFO subject, although I am not at all sold on the alien explanation. Paul wrote: I love the whole UFO subject, although I am not at all sold on the alien explanation. Yeah, the movie "The Phoenix Lights" is also quite good. It's streaming on Netflix, I think, and probably free online somewhere. There is a YouTube Channel called UFOTV Presents that is also quite good, but they do have some junky stuff, too. no, is it better than the average podcast... or do they just love to talk about anything and everything regardless of how kooky it is? I have trouble with stuff like Coast To Coast because there will talk about pretty much anything as if it is plausible. A favorite show of Megan Fox, and yet another reason why she is the perfect woman. sapan wrote: A favorite show of Megan Fox, and yet another reason why she is the perfect woman. They have very, very good production values and some great music. On occasion they go on about something that I'd dismiss as crap, but they're still entertaining with it. Definitely the best paranormal podcast out there. Paul wrote: They have very, very good production values and some great music. On occasion they go on about something that I'd dismiss as crap, but they're still entertaining with it. Definitely the best paranormal podcast out there.